In 2011, IGN ranked Judge Dredd 35th among the top 100 comic book heroes of all time. When comics editor Pat Mills was developing 2000 AD in 1976, he brought in his former writing partner, John Wagner, to develop characters. Wagner had written a Dirty Harry-style "tough cop" story, "One-Eyed Jack", for Valiant, and suggested a character who took that concept to its logical extreme. Mills had developed a horror strip called Judge Dread (after the British ska and reggae artist Alexander Minto Hughes) but abandoned the idea as unsuitable for the new comic; but the name, with the spelling modified to "Dredd" at the suggestion of sub-editor Kelvin Gosnell, was adopted by Wagner. The task of visualising the character was given to Carlos Ezquerra, a Spanish artist who had worked for Mills before on Battle Picture Weekly. Wagner gave Ezquerra an advertisement for the film Death Race 2000, showing the character Frankenstein (played by David Carradine) clad in black leather on a motorbike, as a suggestion of Dredd's appearance. Ezquerra added body-armour, zips, and chains, which Wagner initially objected to. Wagner's initial script was rewritten by Mills and drawn up by Ezquerra. The hardware and cityscapes Ezquerra had drawn were far more futuristic than the near-future setting originally intended; in response, Mills set the story further into the future, on the advice of his art assistant Doug Church. The original launch story written by Wagner and drawn by Ezquerra was vetoed by the board of directors for being too violent. [note 1] A new script was needed for the first episode. Mills initially based the characterisation of Judge Dredd on Brother James, one of his teachers at St Joseph's College, Ipswich. Brother James was considered to be an excellent teacher but also an excessively strict disciplinarian to the extent he was considered abusive. In his blog Mills detailed the moments of rage for which Brother James had a reputation and his own experience witnessing them. The De La Salle monks at the school were a major influence in the 2000 AD design of the 'judge, jury and executioner' attitude of the judges. The name Joseph refers to the school. By this stage, Wagner had quit, disillusioned that a proposed buy-out of the new comic by another company, which would have given him and Mills a greater financial stake in the comic, had fallen through. Mills was reluctant to lose Judge Dredd and farmed the strip out to a variety of freelance writers, hoping to develop it further. Their scripts were given to a variety of artists as Mills tried to find a strip which would provide a good introduction to the character. This Judge Dredd would not be ready for the first issue of 2000 AD, launched in February 1977. The story chosen to introduce the character was submitted by freelance writer Peter Harris,[note 2] and was extensively re-written by Mills, who added a new ending suggested by Kelvin Gosnell. It was drawn by newcomer Mike McMahon. The strip debuted in "prog" (issue) no. 2. Around this time Ezquerra quit and returned to work for Battle. There are conflicting sources about why. Ezquerra says it was because he was angry that another artist had drawn the first published Judge Dredd strip. Mills says he chose McMahon because Ezquerra had already left, having been offered a better deal by the editor of Battle. Wagner soon returned to the character, starting in prog 9. His storyline, "The Robot Wars", was drawn by a rotating team of artists (including Ezquerra), and marked the point where Dredd became the most popular character in the comic, a position he has rarely relinquished. Judge Dredd has appeared in almost every issue since,[note 3] most of the stories written by Wagner (in collaboration with Alan Grant between 1980 and 1988). In 1983 Judge Dredd made his American debut with his own series from publisher Eagle Comics, titled Judge Dredd. It consisted of stories reprinted from the British comic. Since 1990 Dredd has also had his own title in Britain, the Judge Dredd Megazine. With Wagner concentrating his energies on that, the Dredd strip in 2000 AD was left to younger writers, including Garth Ennis, Mark Millar, Grant Morrison and John Smith. Their stories were less popular with fans, and sales fell. Wagner returned to writing the character full-time in 1994. Judge Dredd has also been published in a long-running comic strip (1981–1998) in the Daily Star, and briefly in Metro from January to April 2004. These were usually created by the same teams writing and drawing the main strip, and the Daily Star strips have been collected into a number of volumes. In 2012 Dredd was one of ten British comic characters commemorated in a series of stamps issued by the Royal Mail. Judge Dredd from his first published story, as drawn by Mike McMahon in 1977. The character's appearance has remained essentially unchanged since, except for a more prominent jawline. Joseph Dredd is the most famous of the Street Judges that patrol Mega-City One, empowered to instantly convict, sentence, and sometimes execute offenders. Dredd is armed with a "Lawgiver", a pistol programmed to recognise only his palm-print, and capable of firing six types of ammunition, a daystick, a boot knife and stun or gas grenades. His helmet obscures his face, except for his mouth and jaw. He rides a large "Lawmaster" motorcycle equipped with machine-guns, a powerful laser cannon, and full artificial intelligence capable of responding to orders from the Judge and operating itself. Dredd's entire face is never shown in the strip. This began as an unofficial guideline, but soon became a rule. As John Wagner explained: "It sums up the facelessness of justice − justice has no soul. So it isn't necessary for readers to see Dredd's face, and I don't want you to". On rare occasions, Dredd's face has been seen in flashbacks to his childhood; but these pictures lack detail. In an early story, Dredd is forced to remove his helmet and the other characters react as if he is disfigured, but his face was covered by a faux censorship sticker. In prog 52, during Dredd's tenure on the Lunar Colonies, he uses a 'face-change' machine to impersonate the crooked lawyer of a gang of bank robbers. In Carlos Ezquerra's original design, Dredd had large lips, "to put a mystery as to his racial background". Not all of the artists who worked on the strip were told of this. Mike McMahon drew Dredd as a black man, while Brian Bolland and Ron Smith drew him as white. The strip was not yet printed in colour, and this went unnoticed. The idea was dropped. Time passes in the Judge Dredd strip in real time, so as a year passes in life, a year passes in the comic. The first Dredd story, published in 1977, was set in 2099, whilst stories published in 2019 are set in 2141. Consequently, as former editor Alan McKenzie explains, "every year that goes by Dredd gets a year older – unlike Spider-Man, who has been a university student for the past twenty-five years!". Therefore Dredd is over seventy years old, with sixty years of active service (2079–2141), and for almost thirty years Dredd's age and fitness for duty were recurring plot points (in prog 1595 (2008), Dredd was diagnosed with benign cancer of the duodenum). How Dredd's ageing would be addressed was a source of reader speculation until 2016, when writer Michael Carroll and artist Ben Willsher published the story "Carousel", in which Dredd is ordered to undertake rejuvenation treatment. Regarding the possible death of the character, in an interview with Empire in 2012 Wagner said: "There could be many ways to end it, but the probability is that I won't still be around when it happens! I would love to write it, but I can't see it happening. I'll leave the script in my will". Senior Judge Joseph Dredd and his brother Rico Dredd were cloned from the DNA of Chief Judge Fargo, the first Chief Judge, in 2066. Their growth was artificially accelerated to an apparent physiological age of 5, with all the appropriate knowledge for their age electronically implanted in their brains during gestation. The name 'Dredd' was chosen by the genetic scientist who created them, Morton Judd, to "instill fear in the population". As cadets during the Atomic Wars of 2070, they were temporarily made full Judges to restore order to the panic-stricken streets. Distinguishing themselves, they were chosen to take part in assaulting the White House when the Justice Department deposed President Booth. They were fast-tracked through the Academy of Law, Joseph graduating second in the class of 2079, while Rico came first. Later that year, Joseph arrested Rico for murder and corruption. Twenty years later, when Rico sought revenge after serving a 20 year sentence, Joe was forced to shoot him in self-defence. Joe Dredd excelled as a Judge, rapidly gaining promotion to the rank of senior judge. Offered the opportunity to become Chief Judge in 2101, Dredd declined, preferring to serve on the streets enforcing the law. He has however served temporarily in other senior positions. In "Tour of Duty", Dredd was appointed to the Council of Five, Mega-City One's highest governing body, on which he served for two years. On several occasions he saved his city from conquest or destruction by powerful enemies, and in 2114 he saved the entire world during the Fourth World War. Although Dredd holds his duty above every other priority, this devotion is not blind. On two occasions (in "The Robot Wars" and "Tale of the Dead Man"), Dredd resigned from the force on points of principle, but both times he returned. In 2113, Dredd insisted that the Justice Department gamble its existence on a referendum to prove its legitimacy. In 2116, he risked 20 years' imprisonment with hard labour when he challenged the policy of a chief judge; and in 2129, he threatened to resign to persuade another Chief Judge to change the city's harsh anti-mutant apartheid laws. In 2130, Dredd was diagnosed with cancer of the duodenum, though it was benign. Rico Dredd: Judge Dredd's clone 'brother'. Soon after Joseph and Rico became Judges, Rico became corrupt, forcing Joseph to imprison him. Twenty years later, Rico sought revenge, and Joseph was required to kill him. Judge Kraken: He is another clone brother from the same stock as Joseph and Rico Dredd, but from a later batch produced by a rogue operator. Vienna: Dredd's niece, fathered by Rico in jail. Dredd has gone out of his way to save her on occasion. Judge Rico: Dredd himself has been cloned. One such clone, who adopted "Rico" as a surname, is often mistaken for Dredd. Judge Rico eventually inherited Dredd's apartment at Rowdy Yates Block. Dolman: Another Dredd clone; formerly a trainee judge and member of the MC1 Space Corps. Cadet Paris: A recent addition to the family – an SRY depleted female clone of Dredd. Judge Anderson: For years, Dredd had a close but uneasy friendship with Cassandra Anderson of Psi Division, which came to an end when Anderson briefly abandoned the law. Later, after she returned to duty, Dredd denied this friendship, but he re-affirmed it after she was injured while saving the city. Judge Hershey: Dredd has known Chief Judge Hershey since 2102. Like all Chief Judges since Goodman, Dredd has easy access to her, but they also have a personal relationship based on mutual respect. Dredd believes her to be "the best Chief Judge we've ever had". Walter the Wobot and Maria: Dredd used to share his flat with a domestic robot called Walter the Wobot, who performed all his domestic chores. Dredd also had a landlady called Maria. In later years, Dredd parted company with both. Walter later reappeared and Dredd reassigned him to take care of elderly widow Mrs. Gunderson. Galen DeMarco was a Judge infatuated with Dredd. This breach of regulations led to her resigning from the force and becoming a private investigator. Dredd tried to help her adjust to civilian life; but when he further rejected her advances, she eventually severed contact. Fargo clan: Revealed in 2006 was a town occupied by the mutated descendants of Ephram Fargo, the twin brother of Chief Judge Eustace Fargo. These mutants, who share the common mutation of an overly large, exaggerated chin, are relatives of Judge Dredd himself, and consider him a "cousin". This led to Dredd campaigning to have Mega-City One's mutant segregation laws repealed. Judge Beeny is a Judge who, since 2007, Dredd has taken as his protégée. On Dredd's recommendation, Hershey appointed her to the Council of Five. Judge Morphy was Dredd's mentor at the beginning of his career, until killed in the line of duty. Judge Logan was Dredd's assistant for a number of years. He was later promoted to sector house chief. Dredd encouraged Logan to become chief judge when Hershey resigned, and Dredd's public endorsement of him was instrumental in Logan attaining that office. Street Judges act as police, judge, jury, and executioner. Capital punishment in Mega-City One is rarely used, though deaths while resisting arrest are commonplace. Numerous writers have used the Judge System to satirize contemporary politics. Judges, once appointed, can be broadly characterised as "Street Judges" (who patrol the city), and administrative, or office-based Judges. Dredd was once offered the job of Chief Judge; but refused it. The incorruptibility of the Judges is supposedly maintained by the Special Judicial Squad (SJS), although SJS Judges have themselves broken the law on occasion, most notably SJS head Judge Cal who killed the Chief Judge and usurped his office for himself. The Judge System has spread world-wide, with various super-cities possessing similar methods of law enforcement. As such this political model has become the most common form of government on Earth, with only a few small areas practicing civilian rule. There is an international "Judicial Charter" which countries and city states join upon instituting a Judge System. The setting of Judge Dredd is a dystopian future Earth damaged by a series of international conflicts; much of the planet has become radioactive wasteland, and so populations have aggregated in enormous conurbations known as 'mega-cities'. The story is centred on the megalopolis of Mega-City One, on the east coast of North America. Within Mega-City One, extensive automation (including intelligent robots) has rendered the majority of the population unemployed. As a consequence, the general population is prone to embracing any fashion or craze they encounter. Mega-City One is surrounded by the inhospitable "Cursed Earth". Much of the remaining world's geography is somewhat vague, although other mega-cities are visited in the strip. Mega-City One's population lives in gigantic towers known as City Blocks, each holding some fifty thousand people. Each is named after some historical person or TV character, usually for comic effect. For example, Joe Dredd used to live in the Rowdy Yates Block – Rowdy Yates was a character in the American TV cowboy drama Rawhide, played by a young Clint Eastwood. Eastwood would later play the lead in Dirty Harry – one of the thematic influences by which Judge Dredd was inspired. A number of stories feature rivalries between different blocks, on many occasions breaking into full-scale gun battles between them (such as in the story "Block Mania"). The story Origins revealed that Mega-City One was formed by urban sprawl rather than deliberate design, and by 2051 it was recognised as the world's first mega-city. The Judges' powers reflect the difficulty of maintaining order. Mega-City One extends from Boston to Charlotte; but extended into Florida before the Apocalypse War laid waste to the southern sectors. At its height, the city contained a population of about 800 million; after the Apocalypse War, it was halved to 400 million. Following Chaos Day in 2134, the city was reduced to 50 million. However immigration quickly increased the population to 72 million by 2137. There are four other major population centres in Dredd's Northern America: the first is Texas City, including several of the southern former United States and based on Wild West manners. South of the city is Mex-City. Far north is Uranium City. Canada, now called Canadia, remains a nation with scattered communities. Mega-City Two once existed on the West Coast, but was destroyed in 2114 during the world war known as Judgement Day. Nuclear deserts and destruction elsewhere in the world are also extensive: much of the north Atlantic is severely polluted, and is now known as the "Black Atlantic". An underwater settlement known as Atlantis exists in the Atlantic, half-way along a tunnel from Mega-City One to Brit-Cit (England). Nuclear desert also stretches across western Europe. The British Isles are Brit-Cit, Cal-Hab (Scotland), and Murphyville in Ireland (a country-sized theme park depicting a stereotypical view of traditional Irish life). The continent has Euro-City (eastern France and part of Germany), Ciudad España (eastern Spain), the Ruhr and Berlin Conurbs in Germany, Vatican City, and a scattering of other city-states. Russia's East-Meg One was destroyed by Dredd at the climax of the Apocalypse War in 2104. Further east is East-Meg Two, which has other territories under the "Sov Block" banner. Mongolia, lacking a Mega-City or Judge system, has called itself the Mongolian Free State and criminals have flocked there for a safe haven; East-Meg Two performed vicious clearances there in 2125. Compared to North America and Europe, South America is shown to be in much better condition. Large fertile farmlands still exists and feed many cities worldwide, as do jungles and a variety of wild life. The main population centres are the highly corrupt cities of Ciudad Barranquilla in Argentina and Pan-Andes Conurb in the Andes on the Bolivian and Peruvian borders. Formerly two other cities existed, South-Am City and Brasilia, both of which were annihilated on Judgement Day. In Asia, separated from East-Meg Two by an extensive nuclear desert, are Sino-City One (destroyed during Judgement Day) and Sino-City Two in eastern China, with Hong Tong built in the remains of Hong Kong and partitioned between Sino-Cit and Brit-Cit control. Hondo City lies on the remains of the islands of Japan. Nu-Delhi (previously Indo-Cit and Delhi-City) is in southern India. Surrounding Sino-City 2 is the Radlands of Ji, a nuclear desert containing outlaw gangs and martial arts schools. In the Pacific cities survive in south-east Australia or "Oz" (the Sydney-Melbourne Conurbation), the Solomon Islands (Solomon City), Tonga (Friendly City), and the New Pacific City; New Zealand is said to exist as well. All of Indonesia's islands are now linked by a network of mutant coral called "The Web", described as a lawless hotbed of crime, although a city called Djakarta did exist there at one point but was lost on Judgement Day. The Middle East is without many major cities, being either nuclear or natural deserts, and only the mega-city of Luxor, Egypt has survived; the Mediterranean coast is heavily damaged by mutagens. In Africa much of the south is nuclear desert and a 'Great African Dustbowl' has formed in the north-west; but a large number of nation states have survived, whereof Simba City (Gabon), New Jerusalem (Ethiopia), Zambian Metropolitan, and Dar es Salaam are the largest cities. Nuclear fallout and pollution appear to have missed Antarctica and the Arctic, allowing one mega-city (Antarctic City) to be constructed there. The high levels of pollution have created instances of mutation in humans and animals. The mega-cities largely operate on a system of genetic apartheid, making expulsion from the cities the worst punishment possible. Mega-City One ended apartheid in the 2130s, but encourages mutants to move to Cursed Earth townships instead of remaining in the city. Earth's moon has been colonised, with a series of large domes forming Luna City; another colony, Puerto Luminae, exists but is lawless. In addition, many deep space colonies have been established. Some are loyal to various mega cities, while many are independent states, and others still face violent insurgencies to gain independence. The multi-national Space Corps battles both insurgencies and external alien threats. The newly discovered planet 'Hestia' (which orbits the Sun at 90 degrees to Earth's orbit) has a colony; there are some references to colonies on Mars; Saturn's moon Titan has a judicial penal colony; and Mega-City One is known to have deep space missile silos on Pluto. The paranormal is both common and often openly visible and so is accepted by both civilians and Judges. Ghosts, demons, ancient gods and two different creatures both claiming to be Satan have appeared in Mega-City One. Magic is real and has been practiced by some criminals. Psi Divisions worldwide tend to be the main defence against such threats. A list of all Judge Dredd stories to appear in 2000 AD from March 1977 to September 2018 (#1 to #2100) can be found here (.pdf file). A list of all Judge Dredd stories to appear in the Judge Dredd Megazine from October 1990 to September 2018 (#1 to #400) can be found here (.pdf file). Almost all[note 4] of the stories from both comics are currently being reprinted in their original order of publication in a series of trade paperbacks. Stories from the regular issues of 2000 AD and the Megazine are collected in a series entitled Judge Dredd: The Complete Case Files. This series began in 2005. Stories from special holiday issues and annuals appeared in Judge Dredd: The Restricted Files. This four-volume series began in 2010 and concluded in 2012. The Robot Wars (2000 AD progs 10–17; prologue in prog 9) The Mega-City Judges face an uprising by the city's robot servant workforce, led by carpenter-droid Call-Me-Kenneth. The first multi-part Dredd story. The Cursed Earth (progs 61–85): Dredd, accompanied by punk biker Spikes Harvey Rotten (and later the alien Tweak), leads a small group of Judges on an epic journey across the Cursed Earth, transporting the vaccine for the deadly 2T-FRU-T virus that is devastating Mega-City Two. (This multi-part epic, often referred to as ‘the first Dredd epic’, was inspired by Roger Zelazny's Damnation Alley. Oz (progs 545–570) When sky-surfer Chopper breaks out of jail and flees to the Sydney-Melbourne Conurb in Australia to take part in the (now legal) Supersurf 10, Dredd is sent to retrieve him. In addition Dredd’s real mission is to confront the Judda, a religiously zealous army of clones, ruled over by former Council of Five member Morton Judd, who plans to dominate Mega-City One with his followers. Dredd destroys the Judda’s base (Ayers Rock) with a nuclear bomb, although some Judda are captured. A Letter to Judge Dredd (prog 661) Dredd receives a letter written by a child who has been killed as an indirect result of the Judges' suppression of a pro-democracy demonstration, causing him to seriously question the entire ethical basis of the Judge system, and setting in motion the chain of events recounted in the episodes that follow. Tale of the Dead Man (progs 662–668) Dredd resigns and takes the Long Walk following his assessment of ex-Judda Cadet Judge Kraken, and his crisis of faith in the Law that he had always sworn to uphold. This story acts as a prologue to Necropolis. Necropolis (progs 674–699; prologues in 669–673) Manipulating the confused mind of Judge Kraken, the Sisters of Death use Psi-Judge Agee to take control of Mega-City One and create a trans-dimensional bridge enabling the Dark Judges to manifest themselves. The four Dark Judges take control of the Judges and begin systematically killing the entire population. Kraken becomes a fifth Dark Judge and Chief Judge Silver is killed. The Devil You Know and Twilight's Last Gleaming (progs 750–753 and 754–756) The long running tensions between the totalitarian Judge system and the movement for the restoration of democracy in the Mega-City at last come to a head. Given a vote, the apathetic population take no part; and of those that do, the majority favour keeping the Judges in control. A pro-democracy protest march of almost two million people heads for Justice Central, but violence is averted when Dredd convinces the leaders that the referendum was fair. America (Megazine 1.01–1.07) Dredd's philosophy is explored when democracy activists resort to terrorism. This story introduces the tragic characters America Jara and Bennett Beeny, as well as terrorist group 'Total War'. Batman/Judge Dredd: Judgement on Gotham, an intercompany crossover story co-published by DC Comics and Fleetway. Dredd and Batman reluctantly join forces to defeat Judge Death, who has used dimension-jump technology to breach the DC Universe and attack Gotham City. This comic book featured painted artwork by Simon Bisley. It was followed by three other crossovers written by the same writers as the first one (but different artists): Batman/Judge Dredd: Vendetta in Gotham, Batman/Judge Dredd: The Ultimate Riddle and Batman/Judge Dredd: Die Laughing #1–2. Mechanismo trilogy (Megazine 2.12–17, 2.22–26 and 2.37–43) After Necropolis and Sabbat's zombies, Mega-City has lost far too many judges. To combat this, the Chief Judge test-runs ten robotic Judges, with disastrous results. Inferno (progs 842–853) Escaped rogue Judges from Titan take over the city, forcing the Judges into exile in the Cursed Earth. Wilderlands storyline (progs 891–894 and 904–918 and Megazine 2.57–2.67) Dredd is exposed as falsifying evidence to shut down the Mechanismo project and is arrested, while Chief Judge McGruder attempts to remain in power and see Mechanismo implemented. When a malfunctioning Mechanismo crashes a space cruiser on an alien world in an attempt to kill McGruder, Dredd takes control of the survivors. This story ended many long-running subplots including the Mechanismo Program and McGruder's second stint as Chief Judge, as well as introducing Judge Volt, reviving the Council of Five, and introducing Judge Castillo. The Pit (progs 970–999) Dredd takes the job of Sector Chief at Sector 301, an isolated area of the city that has become a dumping ground for corrupt and incompetent judges. Introduced the popular character Judge Galen DeMarco, who would become protagonist of her own strip. The Doomsday Scenario (progs 1141–1164 and 1167, and Megazine 3.52–3.59) The first series to run the same story from different viewpoints concurrently from start to finish, one in 2000 AD and the other in the Judge Dredd Megazine. One is told from the viewpoint of Galen DeMarco, now a civilian, as she is caught up in crimelord Nero Narcos' attempt to take over the city with his army of robots. The other is told from Dredd's viewpoint as he is taken prisoner by Orlok the Assassin and tried by the East Meg One government in exile for his war crimes during the Apocalypse War. Once Dredd escapes (with Anderson's assistance), he secured the help of Brit-Cit in breaking Narcos' control over his robot hordes. The story saw the Judges briefly lose power and Chief Judge Volt commit suicide as a result; whereafter Hershey replaced him. Helter Skelter (progs 1250–1261) An army of Dredd's greatest foes use inter dimensional travel to invade Dredd's dimension. Their presence starts a collapse of all possible universes, causing characters from other 2000 AD stories to appear in Mega-City One. Dredd defeats the attackers' leader 'Cal' with the help of technician Darien Kenzie. Blood Cadets (progs 1186–1188) saw the introduction of a new clone of Dredd, who took the name Rico; Blood And Duty (progs 1300–1301) saw the return of Dredd's niece Vienna Pasternak. With Vienna's reintroduction and the new Rico's arrival, Dredd was given a family and several new plot points for future stories, including the Justice Department creating a large number of Dredd clones and Dredd's problems trying to connect with his niece. Judge Dredd vs. Aliens (Prog 2003 special and 1322–1335) pitted Dredd against the Xenomorphs, with mutant criminal 'Mister Bones' breeding an army thereof to attack the Department of Justice. Terror and Total War (progs 1392–1399 and 1408–1419) A pair of stories wherein, fanatically dedicated to the democratic cause, the organisation 'Total War' smuggles 12 nuclear devices into the megalopolis and threaten to detonate them all unless the Judges leave the City. A standard thriller plot made more significant through explorations of Judge Dredd's extended family, including Vienna and a Dredd clone, Nimrod. Blood Trails (progs 1440–1449) Following on from elements of Total War and Gulag (where Dredd led a Judge team to try and free prisoners from the Sov block), a clone of Sov Judge Kazan tries to attack Dredd by targeting Vienna, sending the face-changing assassin Pasha to abduct her. In the aftermath of the story, the Kazan clone was cut loose by East-Meg 2 and claimed political asylum from Mega-City One; Dredd's long-term ally Guthrie was severely injured, losing both legs and an arm and eventually becoming a cyborg; and Judges Giant and Rico were severely injured. Origins (progs 1505–1519 and 1529–1535; prologue in 1500–1504) consists largely of flashbacks and sets out the history of the Judges and of Chief Judge Fargo, as well as scenes from Dredd's childhood during the Third World War. Mutants in Mega-City One (progs 1542–1545) is the first in a series of short stories in which Dredd campaigns to change the apartheid laws prohibiting mutants from entering the city. This results in Chief Judge Hershey being voted out of office and replaced with Judge Francisco. Tour Of Duty (progs 1650–1693) sees Judge Dredd posted in the Cursed Earth to oversee the foundations of four new mutant townships. The corrupt Judge Martin Sinfield manipulates Francisco so he can install himself as Chief Judge, and promptly becomes the target of repeated assassination attempts. Dredd is recalled from exile to lead the investigation into the attacks, which are the work of serial mass-murderer PJ Maybe, who has assumed the identity of mayor Byron Ambrose. Day of Chaos (progs 1743–1789) depicts the deaths of 87 per cent of the population of Mega-City One by a biological weapon unleashed by survivors of the Apocalypse War. Every Empire Falls (progs 1973–1990 and Megazine 371–374) tells of an attempted coup in Mega-City One by the chief judge of Texas City, Pamela Oswin. Dredd is secretly kidnapped and his death is staged to conceal the kidnapping. Shortly before the release of the 1995 movie, three new comic book titles were released, followed by a one-off comic version of the film story. Another DC Comics title, lasting 13 issues between 1994 and 1995. Although these were intended to feature the same version of Judge Dredd as in the other DC title, the first four issues were written by John Wagner and Alan Grant and were consistent with their original 2000 AD version. From the same publishers as 2000 AD, this was nevertheless a completely different version of Dredd aimed at younger readers. Editor David Bishop prohibited writers from showing Dredd killing anyone, a reluctance which would be completely unfamiliar to readers acquainted with the original version. As one reviewer put it years later: "this was Judge Dredd with two vital ingredients missing: his balls." It ran fortnightly for 23 issues from 1995 to 1996, plus one "Action Special". Written by Andrew Helfer and illustrated by Carlos Ezquerra and Michael Danza. Published by DC Comics in 1995, but a different version of Dredd to that in the DC comics described above. From the same publishers as 2000 AD, this was a series of ultra-violent one-off stories from "a separate and aggressive Dredd world". The first eight episodes were originally published in Rock Power magazine, and were all co-written by John Wagner and Alan Grant and illustrated by Simon Bisley. These were reprinted, together with eleven new stories (some by other creators), in the Judge Dredd Megazine. The original eight stories were collected in a trade paperback by Hamlyn in 1993. The complete series was collected by Rebellion Developments in 2009. In November 2012 IDW Publishing began a new monthly series written by Duane Swierczynski and illustrated by Nelson Daniel. It lasted for 30 issues. IDW began a new four-issue mini-series called Judge Dredd: Year One in March 2013, set during Dredd's first year as a judge. In September 2013, IDW began publishing the four-issue mini-series Mars Attacks Judge Dredd. In January 2014 IDW began another mini-series, Judge Dredd: Mega-City Two. There were five issues. In July 2015 IDW announced a new mini-series called Judge Dredd: Mega-City Zero, starting in January 2016. This ran for 12 issues, and then was followed by a sequel, set ten years later, called Judge Dredd: The Blessed Earth, which lasted for nine issues. IDW and Dark Horse Comics published a four issue mini-series, Predator vs Judge Dredd vs Aliens, beginning in July 2016 and ending in June 2017. A four-issue mini-series, Under Siege, began in May 2018. It is not connected with any previous IDW Judge Dredd series. Toxic begins in October 2018 and will run for four issues. An American film loosely based on the comic strip was released in 1995, starring Sylvester Stallone as Dredd (it was said that Arnold Schwarzenegger was originally requested for the role, but declined because in the original script, Dredd would keep the helmet on during major parts of the film). The film received negative reviews upon its release. It currently holds a 15% rating on review aggregator website Rotten Tomatoes, with the critical consensus stating that "Director [Danny] Cannon fails to find the necessary balance to make it work". In deference to its expensive Hollywood star, Dredd's face was shown. In the comic, he very rarely removes his helmet, and even then his real face is never revealed. Also the writers largely omitted the ironic humour of the comic strip, and ignored important aspects of the "Dredd mythology". For example, in the film a "love interest" is developed between Dredd and Judge Hershey, something that is strictly forbidden between Judges (or Judges and anyone else for that matter) in the comic strip. In the United States, the film won several "worst film of the year" awards. I hated that plot. It was Dredd pressed through the Hollywood cliché mill, a dynastic power struggle that had little connection with the character we know from the comic. However the film has since been praised for its depiction of Dredd's city, costumes, humour and larger-than-life characters. Reliance Entertainment produced Dredd, which was released in September 2012. It was positively received by critics with Rotten Tomatoes' rating of 78%. It was directed by Pete Travis and written by Alex Garland. Michael S. Murphey was co-producer with Travis. Karl Urban was cast as Judge Dredd and Olivia Thirlby portrayed Judge Anderson. Dredd's costume was radically redesigned for the film, adding armor plates and reducing the size and prominence of the shoulder insignia. It's high-octane, edge of the seat stuff, and gives a far truer representation of Dredd than the first movie. The film was shot in 3-D and filmed in Cape Town and Johannesburg. Funding was secured from Reliance Big Entertainment. On May 10, 2017, Entertainment Weekly announced that independent entertainment studio IM Global and Rebellion have partnered to develop a live-action TV show called Judge Dredd: Mega-City One. The show is planned to be an ensemble drama about a team of Judges as they deal with the challenges of the future-shocked 22nd century. According to Karl Urban, the studio's concept is to "build the show around more rookie judges and young, new judges", where Dredd himself "would come in and out". Urban stated that he would be interested in reprising the role for this, on the condition that Dredd's part of the story be implemented in a "meaningful way". In November 2018, Rebellion began setting up a new studio in Didcot, valued at $100 million, for Film and TV series based on 2000 AD characters, including Judge Dredd: Mega City One. There have been multiple Judge Dredd games released for various video game consoles and several home computers such as the Sinclair ZX Spectrum, Sony Playstation and Commodore 64. At one time, an arcade game was being developed by Midway Games series but it was never released. It can however be found online and has three playable levels. A game loosely based on the first live action film, called Judge Dredd was developed by Probe Software and released by Acclaim for the Sega Genesis, Super Nintendo Entertainment System, Game Boy, and Game Gear. Bally produced a Judge Dredd pinball machine based on the comics. In 1997, Acclaim released a Judge Dredd arcade game, a rail shooter featuring 3D graphics and full motion video footage shot specifically for the game. Judge Dredd: Dredd Vs. Death was produced by Rebellion Developments and released in early 2003 by Sierra Entertainment for the PC, PlayStation 2, Xbox and Nintendo GameCube. The game sees the return of the Dark Judges when Mega-City One becomes overrun with vampires and the undead. The player takes control of Judge Dredd, with the optional addition of another Human player in co-operative play. The game is a first-person shooter – with key differences such as the requirement to arrest lawbreakers, and an SJS death squad which will hunt down Dredd should the player kill too many civilians. The player can also go up against three friends in the various multiplayer modes which include "Deathmatch", "Team Deathmatch", "Elimination", "Team Elimination", "Informant", "Judges Vs. Perps", "Runner" and more. A novel was based on the game. A costume set for the PlayStation 3 video game LittleBigPlanet was released in May 2009 which contained outfits to dress the game's main character Sackboy as five 2000 AD characters one of which is Judge Dredd. Dredd's uniform is also used to create the Judge Anderson costume for the Sackpeople. In 2012, Rebellion released Judge Dredd Vs. Zombies, a game application for iPhone, Android phones, Windows 8 and Windows Phone. Games Workshop released a Judge Dredd role-playing game in 1985. Mongoose Publishing released The Judge Dredd Roleplaying Game in 2002 and another Judge Dredd game using the Traveller system in 2009. Their licence ended in 2016. In February 2017, EN Publishing announced the new Judge Dredd & The Worlds of 2000 AD Tabletop Adventure Game using the WOIN (What's OLD is NEW) roleplaying game system. On July 17, 2012 Tin Man Games released a Judge Dredd themed digital role-playing gamebook titled Judge Dredd: Countdown Sector 106, available for the iOS operating system. Games Workshop produced a Judge Dredd boardgame based on the comic strip in 1982. In the game players, who represent judges, attempt to arrest perps that have committed crimes in different location in Mega City One. A key feature of the game is the different action cards that are collected during play; generally these cards are used when trying to arrest perps although some cards can also be played against other players to hinder their progress. The winner of the game is the judge who collected the most points arresting perps. Players could sabotage each other's arrest attempts. Additionally, there were many amusing card combinations such as arresting Judge Death for selling old comics, as the Old Comic Selling crime card featured a 2000 AD cover with Judge Death on it. The game used characters, locations and artwork from the comic but is now out of print. In 1987, Games Workshop published a second Dredd-inspired boardgame, "Block Mania". In this game for two players, players take on the role of rival neighboring blocks at war. This was a heavier game than the earlier Dredd boardgame, focused on tactical combat, in which players control these residents as they use whatever means they can to vandalize and destroy their opponent's block. Later the same year, Games Workshop released the Mega Mania expansion for the game, allowing the game to be played by up to four players. Mongoose Publishing have released a miniatures skirmish game of gang warfare based in Mega City 1 called "Gangs of Mega-City One", often referred to as GOMC1. The game features judges being called in when a gang challenges another gang that is too tough to fight. A wide range of miniatures has been released including box sets for an Ape Gang and an Undercity Gang. A Robot Gang was also produced but was released as two blister packs instead of a box set. Only one rules expansion has been released, called "Death on the Streets". The expansion introduced many new rules including usage of the new gangs and the ability to bring Judge Dredd himself into a fight. This game went out of print shortly thereafter but was replaced by the "Judge Dredd Miniatures Game", which was published free in many stages as the company sought feedback from fans and players. In 2012, an expansion was released called "Block War!". Miniatures continue to be manufactured at a slow pace. In November 2017, Osprey Games announced their development of a new graphic adventure card game, entitled Judge Dredd: The Cursed Earth. The game is designed based on The Lost Expedition, a game from designer Peer Sylvester. In the game, 1–5 players "[lead] a team of judges against dinosaurs, mutants, and the Cursed Earth itself". It was released on 21 February 2019. There was a short-lived collectible card game called simply "Dredd". In the game players would control a squad of judges and arrest perps. The rules system was innovative and the game was well-received by fans and collectors alike, but various issues unrelated to the game's quality caused its early demise. There was a four-player pinball game released in 1993, produced by Bally Manufacturing. In 1997 Virgin published a Doctor Who novel by Dave Stone which had originally been intended to feature Judge Dredd, called Burning Heart. However this idea was abandoned after the film was released, and Dredd was replaced by another character called Adjudicator Joseph Craator. In August 2012 Rebellion announced a new series of e-books under the series title Judge Dredd: Year One, about Dredd's first year as a judge (the stories in the comic strip having begun in his 20th year when he was already a veteran). All three stories were published by Abaddon Books in a paperback book called Judge Dredd Year One Omnibus in October 2014. "The Day the Law Died" and "The Apocalypse War" stories were produced by Dirk Maggs and broadcast in 3-minute segments (40 for each story) on Mark Goodier's afternoon show on BBC Radio One in 1995. The cast include Lorelei King and Gary Martin. They were issued separately on dual cassette and double CD. Both titles have since been deleted. "The Apocalypse War" also contains plot elements from "Block Mania", because this story set the scene for the main story. In recent years Big Finish Productions has produced eighteen audio plays featuring 2000 AD characters. These have mostly featured Judge Dredd although three have also featured Strontium Dog. In these Judge Dredd is played by Toby Longworth and Johnny Alpha, the Strontium Dog is played by Simon Pegg. In July 2009 four further Judge Dredd titles were released under the banner "Crime Chronicles", once more featuring Toby Longworth. Note: 3 and 10 are Strontium Dog stories that do not feature Dredd. 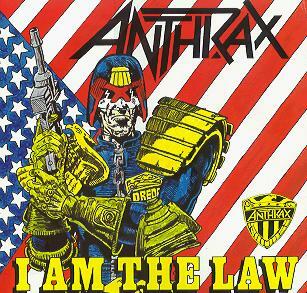 The metal band Anthrax included a song about Judge Dredd on their third album (Among the Living) entitled "I Am the Law". It is one of their most popular and well-known songs, and often features as an encore to setlists. 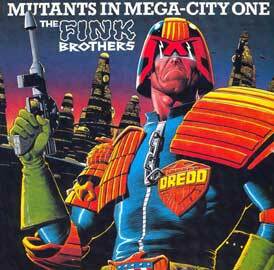 They also released a 12" single and a 7" picture disc, both bearing the image of Dredd. One 12" version featured a fold-out poster of the band dressed as Judges drawn by drummer Charlie Benante. Also, the Cursed Earth tour had Judge Death as the main imagery of the shirts sold during the concerts. The UK ska/Two-Tone band Madness also recorded a tribute single to Dredd under the name of The Fink Brothers, entitled "Mutants in Mega-City One". Released on the Zarjazz label in February 1985, the record featured a cover drawn by 2000 AD Dredd artist Brian Bolland. The UK band The Human League also wrote a song about Judge Dredd. "I am the Law" appeared on the album Dare. The Screaming Blue Messiahs recorded a song entitled "Mega-City One" on their final album Totally Religious. The Manic Street Preachers' song, "Judge Yr'Self" was influenced by the comic, and was intended to appear on the Judge Dredd film soundtrack. It reached the demo stage, but after lyricist and guitarist Richey Edwards disappeared, the other members of the band said that a song for a soundtrack was the last thing on their mind. Edwards himself was heavily influenced by the Judge Dredd and 2000 AD comics (the slogan "Be pure. Be vigilant. Behave" from the 2000 AD strip Nemesis the Warlock was included in the song "P.C.P."). A fully produced mix of "Judge Yr'Self" (by long time Manics producer Dave Eringa) was later released on the 2003 double-album of B-sides and rarities, Lipstick Traces. Richey was a great fan of Judge Dredd and even had one of his drawings published in the comic during his late childhood. Richey himself was later parodied as "Clarence" of the "Crazy Sked Moaners" in the Dredd story Muzak Killer: Live! Part 3 (prog 838, 5 June 1993), in a scene which parodied the infamous 1991 incident of Richey carving 4 REAL into his forearm with a razor (Clarence lasers 4 RALE [sic] into his forehead). Simon Pegg is a fan of 2000 AD, and Judge Dredd memorabilia (supplied by the comic) appears in the background of several episodes of Spaced. There is a rapper from Houston, Texas who goes by the name of Judge Dredd. He was featured on two tracks on Chamillionaire's Greatest Hits Mixtape. A sleeve illustration on German metal band Helloween's album Keeper of the Seven Keys Part 1 depicts a pumpkin-headed character (a band trademark) wearing a distinctive Judge's uniform. It's placed next to the lyrics for the song "Future World", and was used as the sleeve illustration for the single release of that track. Multiple references to the 1995 movie are made on the sitcom Scrubs, notably by J.D. at the end of the episode "His Story II", while being wooed by Elliot. Finnish power metal band Sonata Arctica references Judge Dredd in the song "Peacemaker". The British band Pitchshifter, also fans of 2000 AD, released a Judge Dredd t-shirt for their final tour. It included the slogan "13 years punk", referring to how long the band had been together before they broke up. In the Warhammer 40,000 universe, the Imperium's police force, the Arbites, (Latin; translates as Judge or judgment) were visually based upon Judge Dredd stemming from the time Games Workshop held the rights to Judge Dredd games. The current range is more similar in design to RoboCop. The original designs for the Space Marine power armour and bikes also drew heavily on the Judges' uniform and Lawmaster bikes. In return the original design for the Space Marine jet bike also featured in an episode of Judge Dredd as a Judge antigravity bike. A number of artists who have worked on Judge Dredd have also worked for Games Workshop. In the episode "Respawn" of 30 Rock, Liz Lemon is in court purposely trying to get community service in order to avoid spending the summer with Tracy Jordan. While in the court room, the judge's name is "Gregory L. Dredd" or "Judge Dredd". Wizkids / NECA have released four figures of Judge Dredd as part of their Heroclix colectable miniatures game (Rookie, Experienced and Veteran and Promotional versions). These were only released in the United Kingdom, alongside other 2000AD related figures, as part of the "Indy" expansion to the game. This led to something of an outcry from the American fans of both the game and the character, and this style of "regional" figure-release was not continued in later sets of Heroclix. The Promotional version is not legal in normal game play. It has an entirely different blue ringed dial to the standard "Experienced" version, and the word "Promo" on the base. Finnish band Ne Luumäet released a song called "Tuomari" which is about Dredd. In the video game Star Wars: The Old Republic, an achievement for the planet Oricon, home to the Dread Masters, a rogue faction of Sith Warriors, can be unlocked within the game called "I am the Law!" Unlocking the achievement also unlocks a title for the player's character called "Judged Dread". Judge Dredd was satirized by Marvel Comics, by combining the lawman with Looney Tunes character Elmer Fudd to create Judge Elmer Dwedd. This pastiche of Dredd appeared in a handful of issues of Howard the Duck prior to the release of the Judge Dredd movie, and the character was discontinued afterwards. Appeared in Whoopee! comic in 1985, with Sweeny Toddler as Judge Sweeny in one of the final issues of Whoopee! as a solo comic, this parody is now notoriously hard to find. Appeared in Ganjaman #4. Marijuana smoking parody written by Judge Dredd writer John Wagner. A former officer of the Time Variance Authority, he rides a flying and (formerly) time traveling Hopsikle, wields a Peacemaker multipurpose gun, is based in "Brooklynopolis" and is genetically incapable of both lying and humor. Appeared in Buster comic, which was published by Fleetway. As his name implies, Dudd was an inept law officer. Appeared in Viz Magazine in 2016, the deluded watchman of a slots arcade (2 page comic strip). Another Dredd parody, the 1 page Traffic Warden of the Future, appeared in a nearby issue, text and pictures but not a comic strip. Appeared in the Steve Jackson spoof card game Munchkin and "beats you to death for resisting arrest" if you fail to defeat him. In an issue of Oink! comic, which was published by Fleetway, Psycho Gran was transported through a time warp into the far future and materialised in Mega City One just as she is training in a boxing gym and Judge Dredd was arresting a perp. She punches Dredd, knocking him out before apologising and disappearing back through the time warp. Dredd, explaining away his bandaged nose, later tells the Chief Judge that he was attacked by a gang of giant mutants, while behind his back he has the fingers of one hand crossed. Judge Dredd was also parodied twice in Oink! as "Judge Pigg", on the second occasion being featured as the cover star. In issue #1 of the 'Psycho Gran Vs...' comic, published by Dead Universe Comics in 2016. Psycho Gran can be seen punching Dredd, knocking out a tooth in the process. Dredd can be seen thinking: "Oh Grud, not again!" referencing back to their original meeting. Stan Hart and Mort Drucker parodied the 1995 film Judge Dredd in Mad magazine #338, August 1995. The cover of the magazine painted by Frank Frazetta portrayed Judge Dredd with Alfred E. Neuman. 2000 AD crossovers. Judge Dredd's timeline has crossed over with many other 2000 AD stories. ^ The story was eventually published in the Judge Dredd Annual 1981. ^ A complete list of Harris's work for 2000 AD can be found at his entry on the 2000ad.org website. ^ Except issues 109, 155, 1100 and 1138. ^ Excluded from the Complete Case Files series were the stories "America" (Megazine vol. 1 #1–7), "America II" (Megazine vol. 3 #20–25) and "Beyond Our Kenny" (vol. 1 #1–3). They are collected in other trade paperbacks under the titles "Judge Dredd: America" and "Judge Dredd: The Art of Kenny Who?" ^ "Judge Dredd #3 – Dredd's Comportment Chapter 3: The Birth of the Law – Douglas Wolk". Duane Swierczynski. ^ "Judge Dredd: The Mega-History," by Colin M. Jarman and Peter Acton (Lennard Publishing, 1995), p. 17. ^ "DREDD – THE KILLING MACHINE – Pat Mills". Pat Mills. Archived from the original on 1 January 2016. ^ Jarman & Acton, p. 30. ^ Mills, Pat (13 August 2016). "IN THE LASALLIAN TRADITION 2". Pat Mills. Retrieved 30 October 2016. ^ Jarman & Acton, pp. 18 and 24. ^ Jarman & Acton, p. 34. ^ Jarman & Acton, p. 48. ^ Jarman & Acton, pp. 42–43. ^ Jarman & Acton, pp. 62–63. ^ "Dredd Dispenses Law and Disorder". GamePro. IDG (82): 27. July 1995. ^ Jarman & Acton, p. 128. ^ "The Daily Dredds Volume 1". 2000AD.wordpress.com. ^ "BARNEY – thrill zone". 2000ad.org. ^ "Comic book characters on new Royal Mail stamps," BBC website, 19 March 2012 (retrieved 8 March 2015). ^ The British Postal Museum & Archive, 20 March 2012 (retrieved 8 March 2015). ^ Jarman & Acton, pp. 74–75. ^ Jarman & Acton, pp. 56 and 74. ^ "The Face Change Crimes" in 2000 AD #52 (18/2/1978), written by John Wagner, with art by Brian Bolland. Page 14. ^ Jarman & Acton, p. 22. ^ Jarman & Acton, pp. 89–90. ^ Jarman & Acton, p. 112. ^ "Judge Dredd" Megazine #375. ^ "Exclusive: John Wagner And Alex Garland Talk Dredd". empireonline.com. ^ "Judge Dredd: The Complete Case Files". Grovel. ^ "BARNEY – prog zone". 2000ad.org. ^ Jarman & Acton, pp. 139–140. ^ "Michael Carroll – Sprout – Progs for Sprogs". michaelowencarroll.com. ^ Editor Steve MacManus, quoted in John Hicklenton's afterword to the 2009 trade paperback Heavy Metal Dredd. ^ "BARNEY – reprint zone". 2000ad.org. ^ "2000 AD books – Judge Dredd – Heavy Metal Dredd". 2000adonline.com. Archived from the original on 4 March 2016. ^ "Dredd Prequel Comic Online – Movie News – Empire". empireonline.com. ^ "Judge Dredd: Year One Announced". IGN. ^ "Judge Dredd IMDb". Retrieved 3 May 2007. ^ "Judge Dredd IMDb Trivia". Retrieved 3 May 2007. ^ "Judge Dredd". rottentomatoes.com. 30 June 1995. ^ Hanly, Gavin (19 January 2010). "John Wagner on Dredd". 2000 AD Review. Archived from the original on 1 February 2010. Retrieved 27 August 2016. ^ Kemp, Stuart (11 May 2010). "Judge Dredd returning to the big screen". The Hollywood Reporter. Retrieved 12 May 2010. ^ Kate Rodger. "Karl Urban confirms Judge Dredd role". ^ Diana Lodderhose (3 September 2010). "Thirlby joins 'Judge Dredd'". Variety. ^ "'Judge Dredd' to Be Turned Into TV Show". EW.com. Retrieved 10 September 2018. ^ "A Judge Dredd TV show is coming – but it's not the Karl Urban-Netflix series everyone wanted". gamesradar. Retrieved 10 September 2018. ^ "Karl Urban Still Wants to Play Judge Dredd In Mega-City One TV Series". ScreenRant. 4 September 2018. Retrieved 10 September 2018. ^ Stewart Clarke (24 November 2018). "Judge Dredd Owner Rebellion Sets Up $100 Million U.K. Film and TV Studio (EXCLUSIVE)". Variety. Retrieved 24 November 2018. ^ "Judge Dredd: Release information". GameFAQs. Retrieved 21 March 2011. ^ "Internet Pinball Machine Database: Midway 'Judge Dredd'". ipdb.org. ^ Owen Good. "Sackboy is the Law". Kotaku. Gawker Media. ^ "Judge Dredd vs Zombies". App Store. ^ "Judge Dredd vs. Zombies". microsoft.com. Microsoft. ^ "Judge Dredd: Countdown Sector 106". App Store. ^ "» We're sober as a Judge… honest guv'nor! ;)". tinmangames.com.au. ^ "Judge Dredd – Board Game – BoardGameGeek". boardgamegeek.com. ^ "Block Mania – Board Game – BoardGameGeek". boardgamegeek.com. ^ Thrower, Matt (21 January 2019). "Play Matt: Judge Dredd: The Cursed Earth Review". There Will Be Games. Retrieved 19 February 2019. ^ Burbidge, Greg. "Osprey Games announces Judge Dredd: The Cursed Earth | Dice Tower News". www.dicetowernews.com. Retrieved 10 September 2018. ^ "Judge Dredd: The Cursed Earth". BoardGameGeek. Retrieved 19 February 2019. ^ "Dredd: The Card Game – Board Game – BoardGameGeek". boardgamegeek.com. ^ "2000 AD Online – Judge Dredd: Year One City Fathers". 2000 AD Online. ^ "City Fathers by Matthew Smith". Rebellion Publishing Store. ^ a b "2000 AD". bigfinish.com. ^ Image of record from archive.org. Web.archive.org (18 January 2003). Retrieved 4 May 2012. ^ Image of record from archive.org. Web.archive.org (28 September 2007). Retrieved 4 May 2012. ^ "Release: Totally Religious – MusicBrainz". MusicBrainz. 26 September 2008. Retrieved 28 February 2009. ^ Marshall, Rick. "25 Random Facts about Judge Dredd". IFC. Retrieved 26 January 2017. ^ "Howard the Duck (the duck, the myth, the legend)". marvunapp.com. ^ Johnston, Rich (12 June 2017). "John Wagner Writes Parody Judge Dredd Strip 'Judge Dreadz' For Ganjaman". Bleeding Cool. ^ "Justice Peace (Thor, Fantastic Four, Deathlok character)". marvunapp.com. ^ "The Craziest Characters Are Always In Buster Comic!". bustercomic.co.uk. ^ "Munchkin® 2 – Unnatural Axe™ – Card List". worldofmunchkin.com. ^ "Judge Pigg appearances". comicvine.com. ^ "Doug Gilford's Mad Cover Site – Mad #338". madcoversite.com. Bad Moon Rising is an original novel written by David Bishop and based on the long-running British science fiction comic strip Judge Dredd. It is Bishop's fourth Judge Dredd novel. Eclipse is an original novel written by James Swallow and based on the long-running British science fiction comic strip Judge Dredd. It is Swallow's first Judge Dredd novel. Judge Dredd is an action video game for the Super NES, Sega Genesis/Mega Drive, Game Gear and Game Boy originally released in 1995. The game is loosely based on the 1995 film Judge Dredd, which was a spin off from the Judge Dredd strip from 2000AD. Judge Dredd is a comic book series by IDW Publishing, based on the character of Judge Dredd from the British comic magazines 2000 AD and Judge Dredd Megazine. The series is made up of an ongoing series, Judge Dredd, and occasionally a miniseries. There is also a third series, titled Judge Dredd - Classics, which is a republishing, in color, of the original British stories and is not part of the IDW continuity. Judge Dredd is a four-player pinball game produced by Bally Manufacturing in 1993, based on the British comic strip Judge Dredd in 2000 AD. Nearly 7,000 were made. An eight-page full colour promotional comic was released by Bally and Egmont in 1993, which reprinted the story Pinboing Wizard from the Judge Dredd Annual 1981, written by Judge Dredd creator John Wagner and illustrated by Mike McMahon. Judge Dredd: The Megazine is a monthly British comic magazine, launched in October 1990. It is a sister publication to 2000 AD. Its name is a play on words, formed from "magazine" and Dredd's locale Mega-City One. Judge Dredd vs. Aliens is an intercompany crossover, featuring Judge Dredd and the Alien from the Alien franchise. It was published in 2003, weekly in 2000 AD and as a monthly mini-series by Dark Horse Comics. Judge Grice was a fictional character in the Judge Dredd comic strip in 2000 AD. Created in 1990 by John Wagner and Steve Dillon, Grice later had his own spin-off series, Purgatory (1993) by Mark Millar and Carlos Ezquerra. Originally a minor supporting character and one of Dredd's colleagues, he later became a notable villain, at first with (in his opinion) good intentions, but later he descended into psychosis and became truly evil. In the Judge Dredd story "Inferno" (1993) he seized control of Mega-City One and proclaimed himself chief judge. "Judgement Day" is a story of British science fiction character Judge Dredd. It was first published with alternating episodes in both 2000 AD and the Judge Dredd Megazine in 1992. It was the first crossover between the two publications; three more have since followed. It was also a crossover with another 2000 AD series, Strontium Dog, as it featured the second occasion on which Judge Dredd confronted Johnny Alpha (the lead character in Strontium Dog). It was written by Garth Ennis (based on an idea by John Wagner) and illustrated by Carlos Ezquerra, Peter Doherty, Dean Ormston and Chris Halls. Set mainly in 2114 it tells of how the Fourth World War took the lives of three billion people when a powerful necromagus called Sabbat raised all the corpses in the world as zombies. The series is mainly notable because it was Ennis' longest Dredd story, it killed off most of the supporting cast of the Judge Dredd series, and it was the first story to feature Johnny Alpha since he was killed off at the end of the Strontium Dog series (from Alpha's point of view it was set two years before his death). This is a list of organizations in the British comic strip Judge Dredd appearing in 2000 AD, Judge Dredd Megazine and related publications. They are listed alphabetically. Silencer is an original novel written by David Bishop and based on the long-running British science fiction comic strip Judge Dredd. It is Bishop's third Judge Dredd novel. At the time of publication (1994) Bishop was editor of the Judge Dredd Megazine. The Final Cut is an original novel written by Matt Smith and based on the long-running British science fiction comic strip Judge Dredd from 2000 AD. At the time of publication (2005) Smith was editor of 2000 AD. Wetworks is an original novel written by Dave Stone and based on the long-running British science fiction comic strip Judge Dredd. It is Stone's third Judge Dredd novel. Whiteout is an original novel written by James Swallow and based on the long-running British science fiction comic strip Judge Dredd. It is Swallow's second Judge Dredd novel.